(CNN) - Senate Republicans on Wednesday blocked a Democratic effort to keep sanctions on companies tied to Russian oligarch Oleg Deripaska, ending what was the most aggressive congressional pushback so far on the Trump administration's foreign policy toward Russia. The sanctions resolution from Minority Leader Chuck Schumer, which required 60 votes to proceed, was defeated in a 57-42 vote. Vermont independent Sen. Bernie Sanders missed the vote. But the result still represented a symbolic rebuke of the Treasury Department's decision in December to lift the sanctions on the companies tied to Deripaska, a Kremlin ally. Eleven Republicans joined with Democrats to support Schumer's resolution, arguing that the Trump administration erred in deciding to lift sanctions on Rusal, the world's second-largest aluminum producer, as well as EN+ Group and JSC EuroSibEnergo. While the matter is dead in the Senate, the House still could opt to pass the resolution disapproving of the sanctions relief. House Majority Leader Steny Hoyer has introduced a parallel resolution that the House will consider on Thursday, the deadline for invoking congressional review of the sanctions move, according to a Democratic leadership aide. Under a 2017 sanctions law, Congress has the authority to halt any decision by the Trump administration to weaken sanctions, providing lawmakers with a 30-day window to reject the plan. 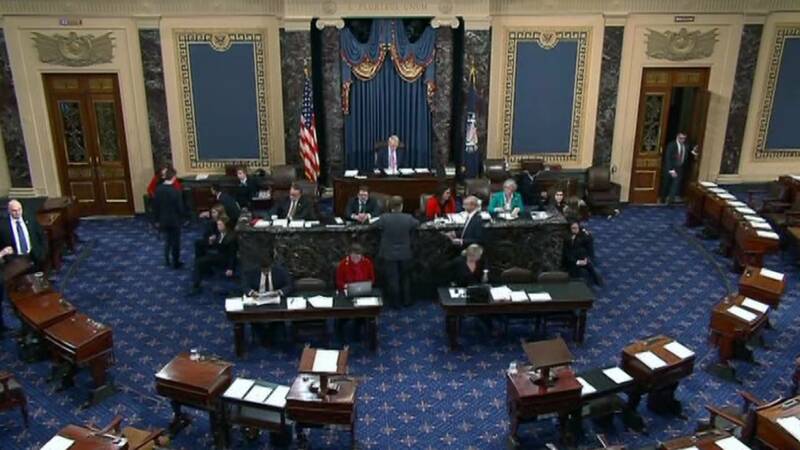 Wednesday's vote came one day after Treasury Secretary Steve Mnuchin went to Capitol Hill in an effort to ease Republican senators' concerns about the sanctions plan. He failed to convince those 11 Republicans who broke with Majority Leader Mitch McConnell later Tuesday to vote with Democrats on Schumer's resolution. "It sends the wrong message to Russia and to the oligarch -- a close ally of Mr. Putin, Oleg Deripaska -- who will in my judgment continue to maintain considerable control under the Treasury's plan," Sen. Susan Collins of Maine, one of the Republicans who voted with Democrats, said after the first vote. The Trump administration argued that the sanctions were only lifted after the Treasury Department reached an agreement with the companies that diluted Deripaska's ownership stake and limited his influence over the voting shares he gave up as part of the deal.